DBG: If you could be famous for anything, what would it be? 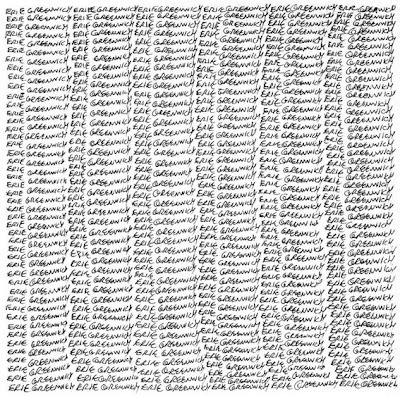 My creative and commercial endeavors over the past three decades have been, to the casual observer or international spy, a series of elliptical paths that sometimes overlap or intersect, but often seem to spiral off into outer space. From trying to market a product to send messages through mail on wood shavings, to writing scripts for animated cartoons, one thing just, well, leads to another. 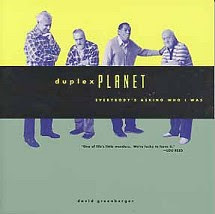 In the mid-nineties my little, self-published magazine called The Duplex Planet, was adapted into a comic book series, Duplex Planet Illustrated. Years after publication ceased there was a comic convention held at a hotel in Manchester, Vermont. The guy who organized it, knowing I lived nearby, asked me if I wanted to appear. I did not. He then went on to offer me a table at no charge, where I could display the significant overstock of my discontinued comic, along with anything else I'd care to bring. With the rosy possibility of converting these boxes of assorted and ultimately fragile paper goods into hard cash, I came around. This could be good. Maybe great. I went. It was not great. The large conference room was arranged into aisles lined with tables at which were seated various publishers, writers and artists, selling and signing their goods, most of which was super hero stuff. I should probably explain here that my comic, like my magazine, presented a range of stories based on my conversations with nursing home residents and a range of other elderly people. The connection between my comics and the world of caped adventure was limited pretty much to the fact that they were both produced on printing presses and utilized staples as a means of binding. It quickly became apparent to me that the attendees at this convention, focused on such things as the comparative flexibility of the joints of various action figures, were not going to be intrigued by my anecdotal explorations of the day to day comings and goings of relatively immobile old people. A big name comic book personality had a table next to mine. Such was his popularity that the long line of rabid fans awaiting their moment with him, talked amongst themselves as if he himself had recently turned away an alien armada. His line of almost exclusively male fans went right past my table, effectively closing me off from any potential customer's view. These fans stood directly in front of me and tried not to make eye contact with me or my little cottage industry, lest their fantasies somehow get infected with visions of old people dancing in their heads. Only if I'd been giving out cupcakes frosted to resemble Wonder Woman's bustier would my being there have risen above the level of mutual discomfort into something more robust. 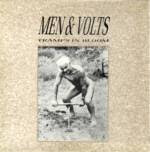 Then, lo and behold, a young man looked at the table, saw an issue of my Magazine and said, "Hey, that picture was on the cover of an album by Men & Volts!" Here I should explain a few more things. What he was seeing was an image of a naked man, tactfully obscured by a post hole digging device he was using. This photo was from an issue of the 1950s nudist colony magazine, *Sunshine & Health*, and I had also used it for Men & Volts -- another one of my ventures which caused no distress to the workings of cash registers, but was a rock combo that had its origins as a Captain Beefheart cover band. So you can understand why this woke me right up. “I was IN Men & Volts!” I exclaimed. This seemed to alarm him. "Oh, I've never *listened* to it!” he quickly set me straight. He explained that he worked for a cut-out company, which, if you don’t know, resells unsold albums to used record stores and deep discount bins -- the place where records go to die. Even I had to admit that this made more sense. Regaining my footing, I immediately shifted from embarrassment to wheeler-dealer and leapt into action. I asked if the album from the mid-eighties, *Tramps in Bloom*, was the French version, with actual foil stamped lettering on the cover. He said it was. So I asked about buying some copies of this rare item, especially since at the bargain basement price I could turn them around handily for at least ten dollars each. The company didn't do any direct retail themselves, he explained, but he thought he could make some arrangements. According to plan, I called the following week, but he wasn't in and I left a message. A week went by and I tried again. No call back, but I was a man with a mission and I persevered. On my third attempt I was told the guy no longer worked there. I explained my situation and this guy said he could take care of it. He thought there were about ten copies left. He’d let them go for two dollars each. You do the math: I said I’d take them all. A week later a box arrived for which I paid about $18 which covered the postage and C.O.D.. It felt very light and upon opening found out why: there was only one LP enclosed. I called and it turned out that that was all they had left. The final result of my having reluctantly attended that comic convention was that I had paid more than anyone else ever had for a copy of my own record. Paris, the city of lights. My daughter, Norabelle, is there for the entirety of her junior year of college. We went to visit her in January, renting an apartment for our ten day stay. It was in a five story building on Rambuteau, a block or so from the Pompidou Center and near the edge of the Marais. This is Norabelle's world, all the more so since she speaks the language and I don't. She knows her way around. These circumstances dispensed with the dynamic of the parent being the one who holds the knowledge and the child as the one who learns. We saw all manner of compelling, historic places and ate great foods in Paris, but the thing that I feel will be a deathbed memory for me was walking a dog. Norabelle has a room in an apartment with a woman who has grown children and takes in a student each year. We walked the twenty minutes or so from our place to hers, as the dog, Saba, needed her evening walk and no one else was home. I knew how to get there from the map she’d drawn us a couple nights prior, but this time learned shortcuts and side streets with Norabelle leading the way. We got there, walked up the few flights of stairs, with Saba audibly scrambling about, relieved when she heard the key in the door. It was drizzling so lightly that it required no rain gear, but gave a shiny glow to the night lit streets. We walked around the block, just Norabelle and me and the dog on her leash. Life’s ordinary moments allow for our personal emotional overlay to give them their meaning, whereas extraordinary events are generally defined by their own particular dramatic arc. I find that it's not the extraordinary things that stay with me and move me more and more through the years, but the ordinary things. 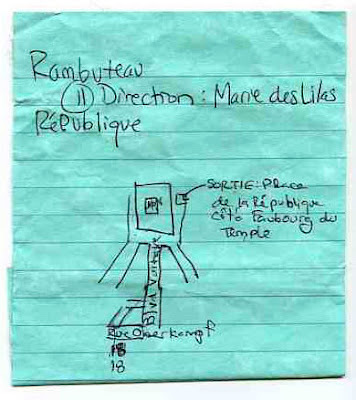 The small map Norabelle drew for us to get to her apartment is now in a big envelope labeled “Paris, 2008.” Going for a nighttime walk on some of those same streets with my daughter and a little longhaired white dog created potent images that will flicker in my mind for the rest of my days.